Gzhel is a style of ceramics which takes its name from the village of Gzhel and surrounding area, where it has been produced since 1802. About thirty villages located southeast of Moscow produce pottery and ship it throughout Russia. The name Gzhel became associated with pottery in the 14th century. Gzhel pottery was originally created by potters in their homes, however fairly early on these potters started to organize into workshops to increase production. The workshops eventually became a factory with pieces being formed in moulds and potters being responsible for separate pieces, a specific style, or decoration. The earliest pieces were created of earthenware. The pottery was painted solid white with distinctive blue designs. Pottery was also produced using a tin based white glaze and coloured glaze designs in blue, green, yellow, and brown, rather than just blue on a white background, in a style that is referred to as Maiolica. The body colour of earthenware varies depending on the raw materials used, and can range in color from white to brown. It is generally fired at lower temperatures than either stoneware or porcelain, and can remain semi-permeable to water until glazed. In the 1830s, the Gzhel potters developed a faience, or white earthenware, of a quality that rivaled the creamware being produced in England at the time. They followed the development of faience with the acquisition of porcelain. Porcelain is fired to a similar temperature as stoneware, but unlike stoneware it becomes a translucent white and as such is highly desirable. 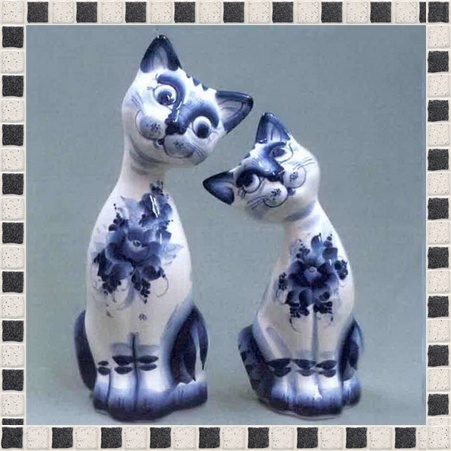 The making of porcelain had been a secret heavily guarded by China with only finished products being exported. 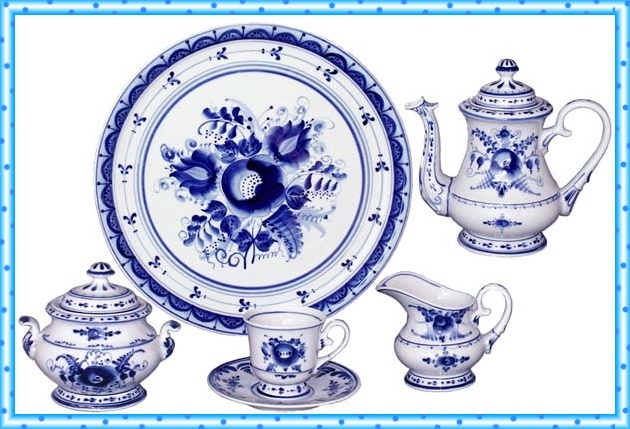 When Russia was able to produce their own porcelain, it undercut the high cost of imports from China or Western European producers. Although there have been several periods of disruption in pottery production at Gzhel, quality pottery is once again being produced in both the recognizable blue on white design as well as the more colorful Maiolica ware.